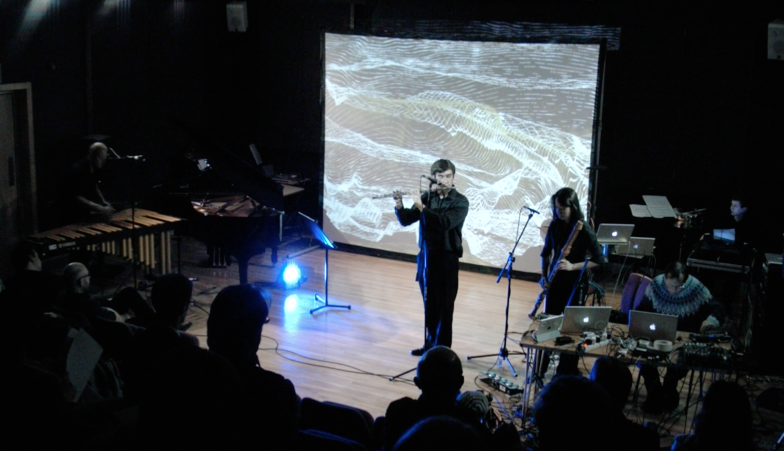 An interactive score turns the concert into live-event of a very special kind: Performer and composer process an interactive score on multiple iBooks and exert mutual influence on them. 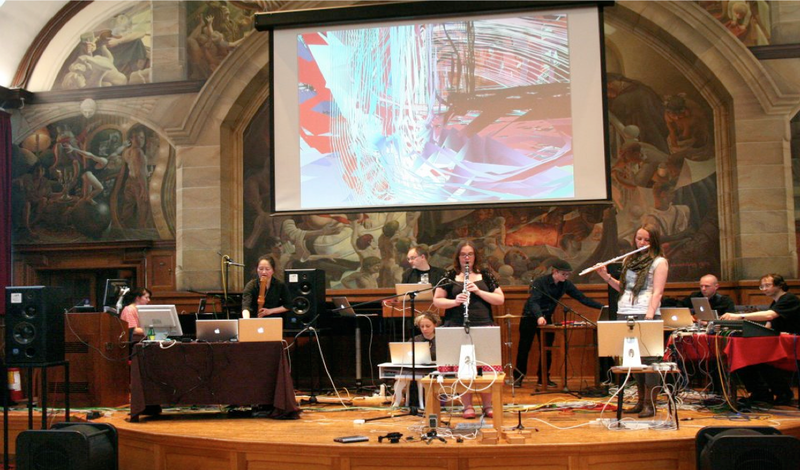 Composer and media artists Andreas Weixler & Se-Lien Chuang from Austria are creating an interactive audiovisual performance together with an open ensemble by muscians of Bangor. 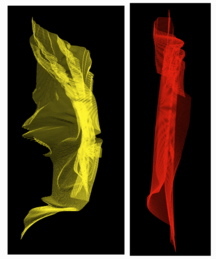 The musical and visual components interact and reciprocally influence each other in order to blend into a unique, synaesthetic, improvisational work of art. 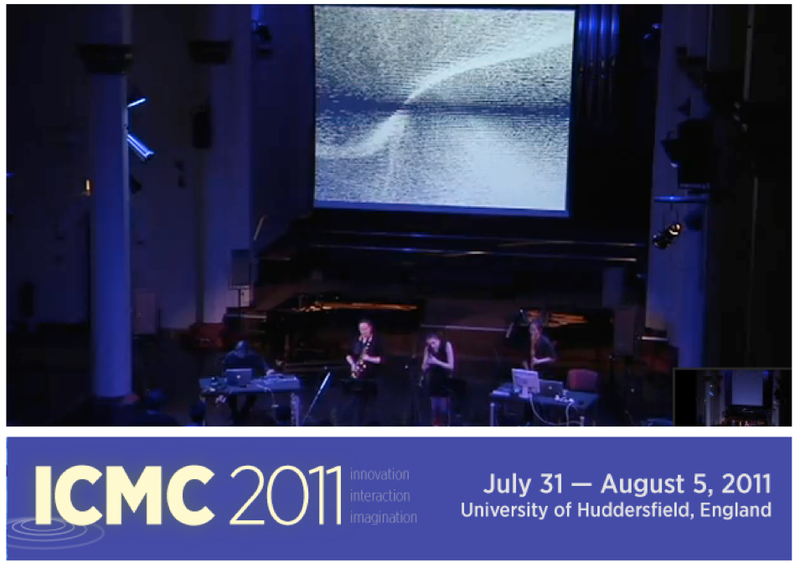 Momentum_Huddersfield has been accepted for concert presentation out of 854 work proposals at this year’s International Computer Music Conference, which will be held at the University of Huddersfield from 31st July-5th August. 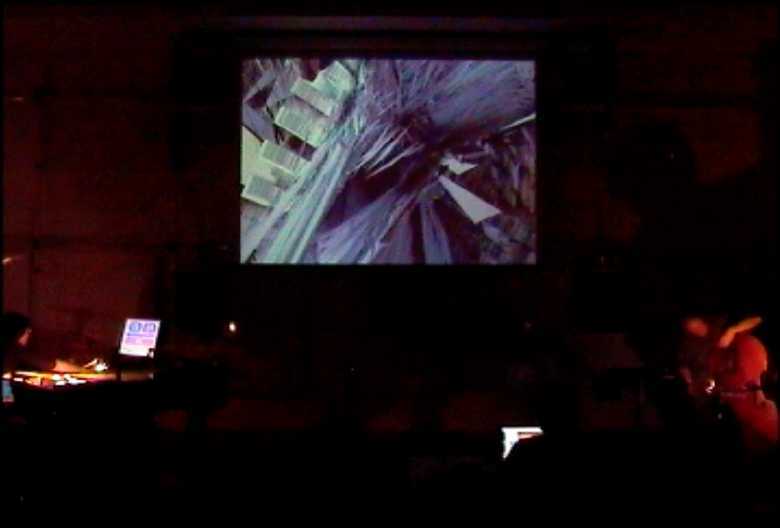 Improvised instrumental music and audiovisual realtime processes interact and reciprocally influence each other in order to blend into a unique work of art of realtime composition. 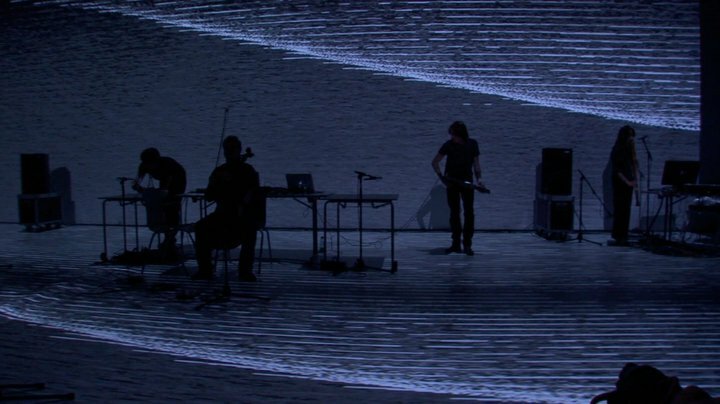 While visual images and processes interact with the music during the concert, a multichannel spectral delay generates a spatialisation of frequency oriented delays, pulses and feedback which sometimes sum up to a even reverberating ambience. Multichannel granular synthesis fits together minute tonal particles that make up the instrumental sounds into a constantly changing acoustic stream made up of different pitches, durations and positions in the electro-acoustic space. 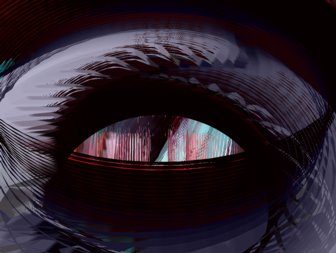 Our art work and research describe the hook-up between human and machine, between musical inspiration and digital concepts. Musical instruments act as interfaces for digital audio processing and enable human beings to communicate with digital technologies as well as to generate, receive and exchange data versus emotions. for `Roots´ Ensemble, Irish traditional and contemporary instruments with bass recorder solo. 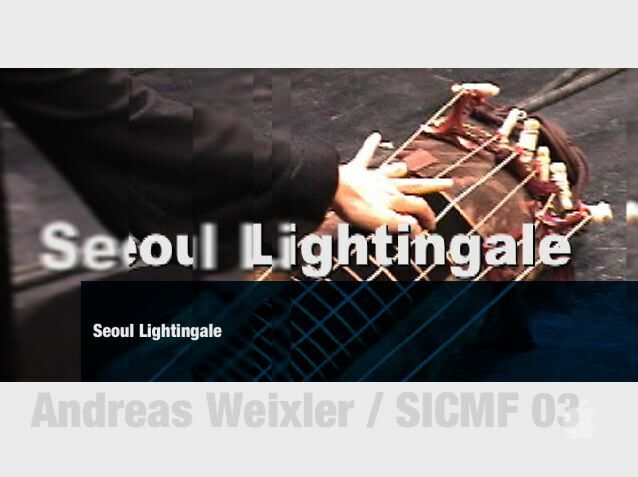 Andreas Weixler, Se-Lien Chuang (Austria) and Kiyoharu Kuwayama , 30 min. 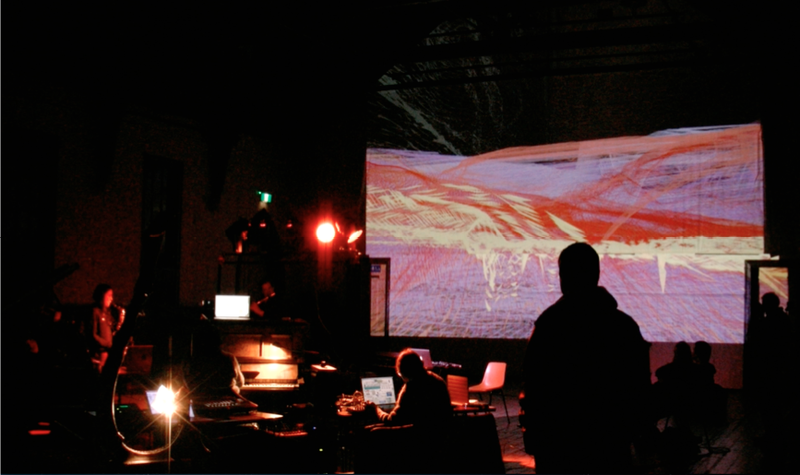 a thrilling projekt with live-elektronics, video projections and improvisational concepts. premiere: 8. Juni 2007, Frederick Loewe Theater, NYU, New York. 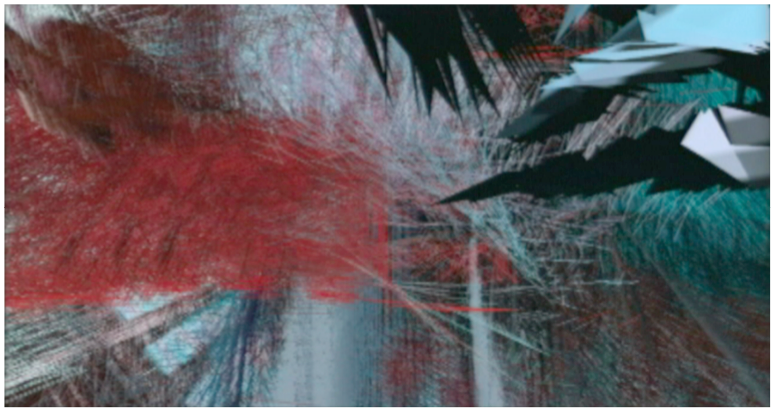 This is the newest concept of an algorithmic composition/improvisation with the audiovisual interactive computer system created by Andreas Weixler and Se-Lien Chuang in the graphical programming environment Max Msp Jitter. 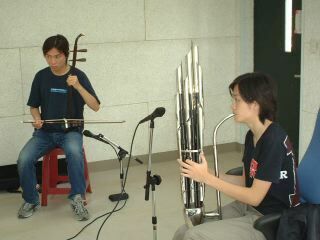 Instruments are played in the style of contemporary composition/improvisation, in this case a bass recorder,which is a wooden flute with a very low register and a smooth sound. 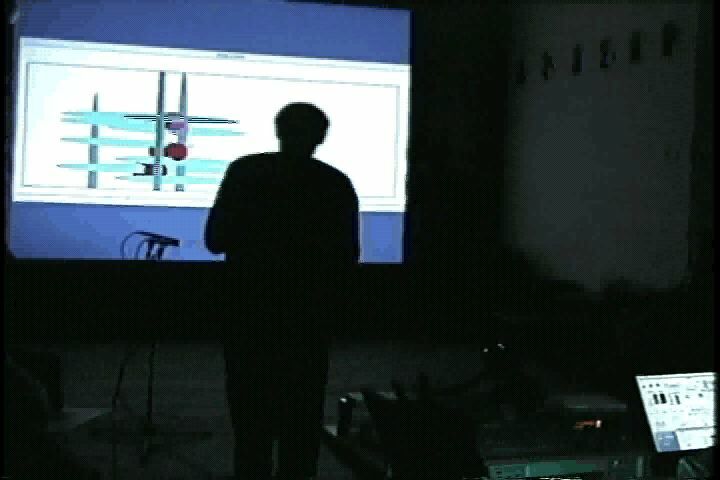 The computer system consists of a pitch and dynamic detection, real-time visual processes and a live multi-channel granular synthesis with advanced controlling and performing methods. All computing devices, the audio detection, the visual and the audio processing are linked via a wireless Lan to reciprocally influence each other. ICMC Konzert am 29.8.2007 im Huset Magstræde. 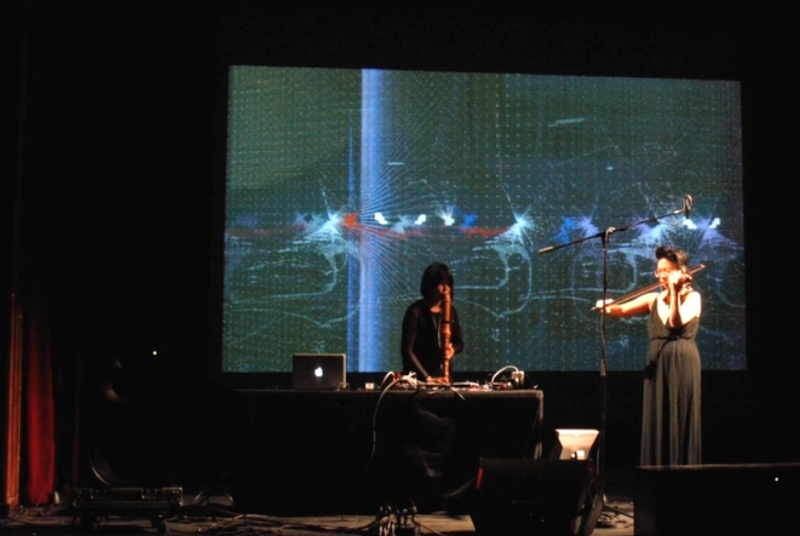 This is the newest concept of an algorithmic composition/improvisation with the audio-visual interactive computer system created by Andreas Weixler and Se-Lien Chuang in the graphical programming environment Max Msp Jitter. Instruments are played in the style of contemporary composition/improvisation, in this case a classic flute. 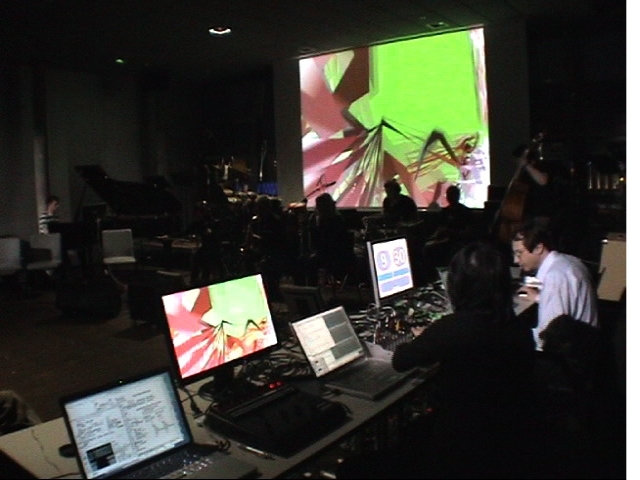 The computer system consists of a pitch and dynamic detection, real-time visual processes and a live multi-channel granular synthesis with advanced controlling and performing methods. All computing devices, the audio detection, the visual and the audio processing are linked via a wireless Lan to reciprocally influence each other. 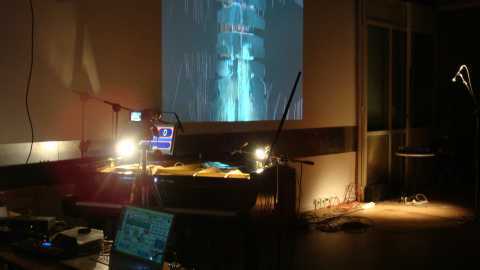 by processing the instrumental sounds in realtime the computer becomes a hyper instrument played in an improvisation along with the arco-piano, spreading its sound on a 8 channel sound system, controlling flocks of grains, rearranging those in terms of pitch, time, order and position in the acoustic environment. 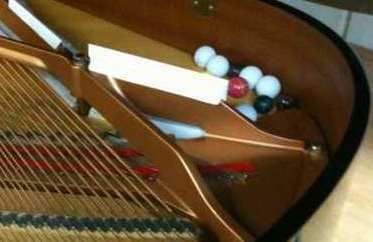 arco-piano is a special contemporary technique of performing the piano with hairs of bows which gives a very sophisticated sound of the piano. 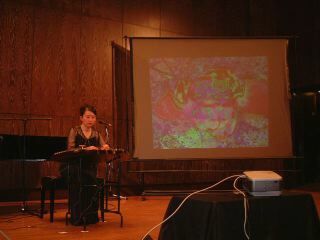 Se-Lien Chuang developed arco-piano technique to the artistic point, where she can control polyphonic sound of the bowed piano strings and their upcoming overtones. three Macintosh G4 Powerbooks are interacting with the players, i.e. 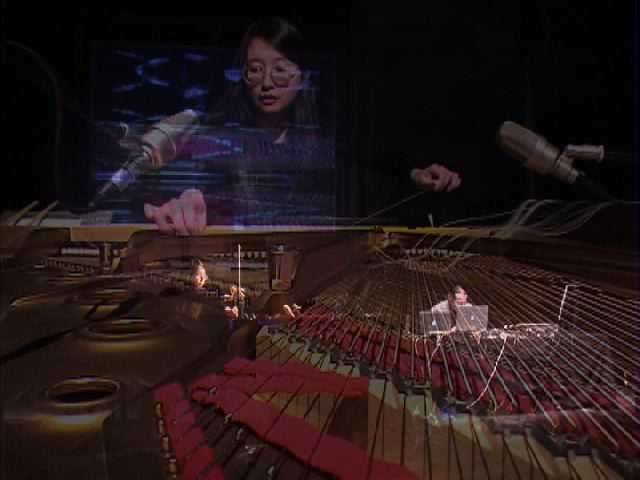 of the arco piano and of the electroacoustic hyper instrument, analyzing the sounds, exchanging data between analysis, audio and video computing to make an age-old dream of artists come true: to make music visible and images audible. 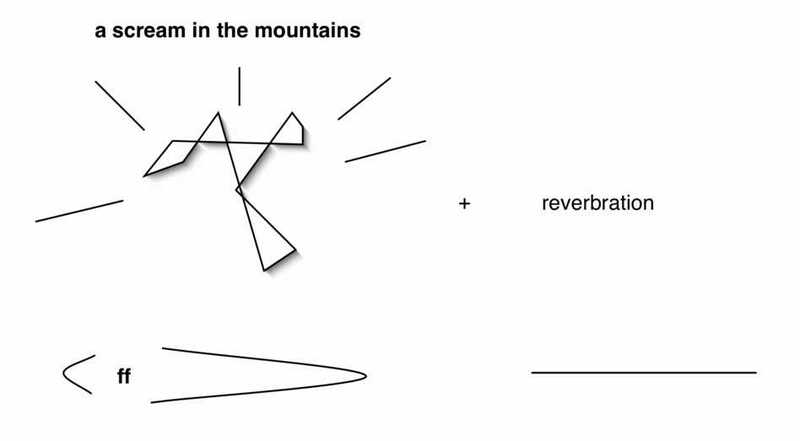 The visual and musical components interact and exercise mutual influence thus leading to unique synthesis of arts. 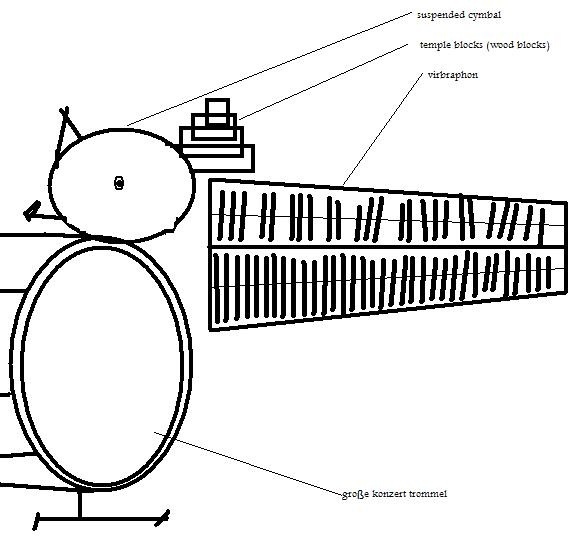 The goal of this project in computer music is to create an interface for visual and music computing for an associated audiovisual composition as well as to find technical and artistic solutions for the combination of traditional asian instruments with high technical computing in the terms of interactivtiy and realtime processing and last but not least to create pure computer music. 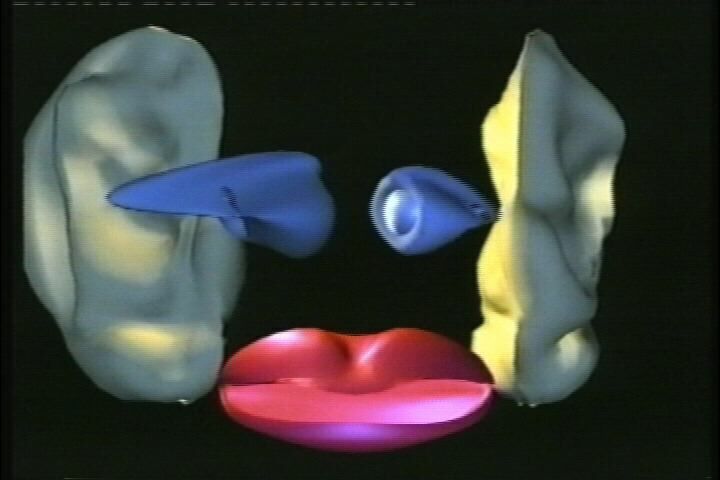 The fragments of memories (from a human as well as a computer) generate the synaesthesis between sounds and images. 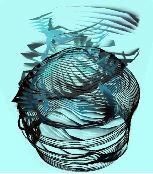 In terms of acousmatics I applied the spatialisation of sounds to integrate the movements of visuals for "the listening imagination". 12.12.2004 electronic access, special asia Japan at ORF RadioKulturhaus Vienna, "Frühstück mit Neutönern"
To generate synaesthesia of audio and visual the live improvisation of instruments will be processed in realtime, generating colors, shapes and pictures accordingly to the frequency range and dynamics. 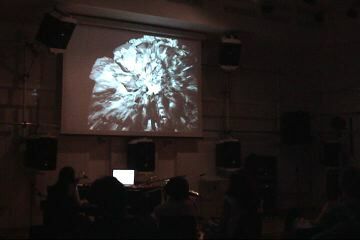 Also the granular synthesis of the sound will be replayed in the performance. The stage aspect associates with the Chinese shadow-puppet-show ( ) and running-figure-lantern ( ) for approaching a mind of cross-culture exchange. Technically this work detects audio by a number of microphones, which are carried by the musicians and dancers (or actor & actress). 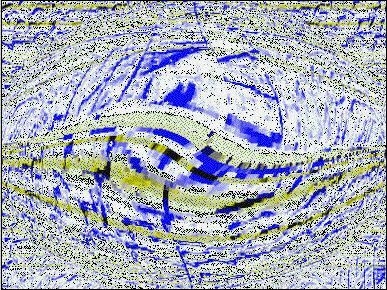 It then makes a choice of pictures accordingly to the sound and transforms those. 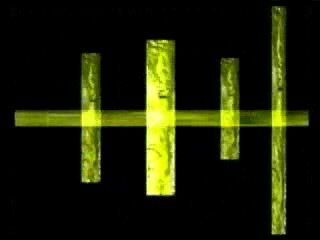 Also the sound will be transformed in stereo of 6 channel by granular synthesis and will fit it in a prepared electroacoustic composition and stage arrangement. The audiovisual ambience and the interpreters are open to the public. The performance is expected, but undetermined. The public can participate in this performance by going and coming through the orbit stage like the moving figures in the Chinese running-figure-lantern. selceted for International Symposium of Electronic Arts 27.- 31 Oktober, Nagoya Japan. ISEA 02 Performance on October 30th, 2003. 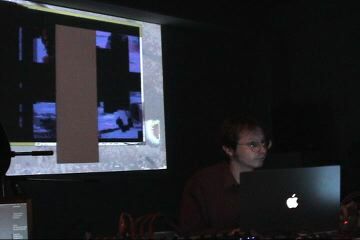 Se-Lien Chuang, concept, visuals and electroacoustic composition, Andreas Weixler Max/msp programming, interactivity and realtime audio processing. 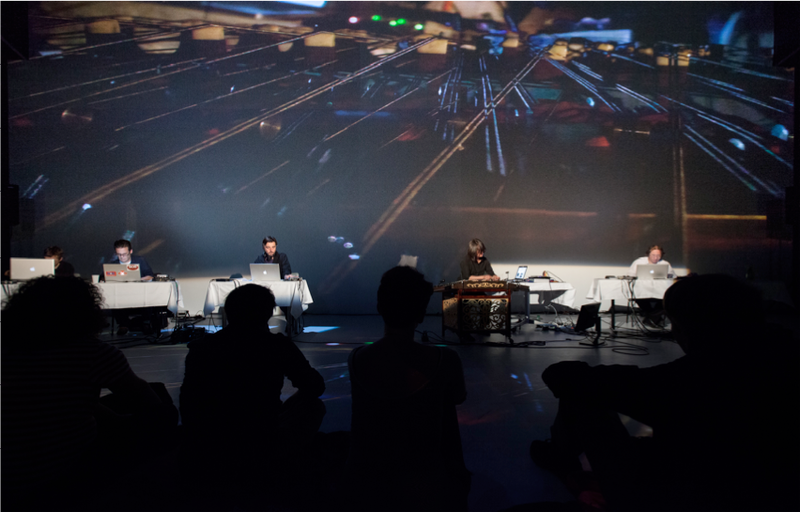 description: The room reacts to the audience in algorithmic choice of pictures and their transformation and processes realtime audio within an electroacoustic composition. The interactive audiovisual installation Living Cave is very flexible to the exhibition site. It detects audio by a number of microphones, which could be hidden in room or be handed out to selected persons of the audience aswell. It then makes a choice of pictures accordingly to the sound and transform those. Also the sound will be transformed in stereo or 4 channel by granular synthesis and will fit in a prepared electroacoustic composition. All in all it creates a visual and audio ambience accordingly to the sound fed into the system. 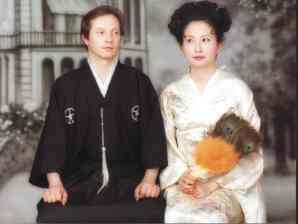 26.10.-4.11.2001 artport & media select, Nagoya, Japan. 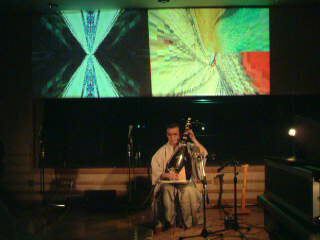 description: based on the japanese spirit of harmony the computer senses harmony between the players and acts accordingly to them in generating audio and visual. rhythm the music of each language, see the expression. concept and max/msp progamming by Andreas Weixler. description: the audio data of a grand piano playing Vexations by Erik Satie will be processed in granular synthesis, and if silented a Disklavier playes Gymnopedie alltogether with a live visual improvisation. A piano player keeps on playing Vexations by Erik Satie in one concert hall. 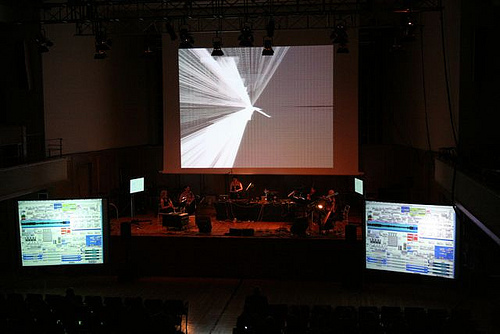 The audio signal will be transmitted to another concert hall, where it feeds the input of a Macintosh computer equiped with Max/msp. The Max/msp patch listens whether the grand piano is played by the performer or not. If not Max starts a sequence of Gymnopedie No1 and No 2 performed. 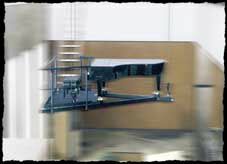 If the grand piano is playing the computer silences the Disklavier and starts a realtim audio processing the signal of the grand piano. While the listener in concert hall 1 can listen to a piano piece of Erik Satie, the listener in concert hall 2 will hear a computer processed interactive electro acoustic piece with a live Disklavier and realtime granular synthesis based on what is played in the other room. 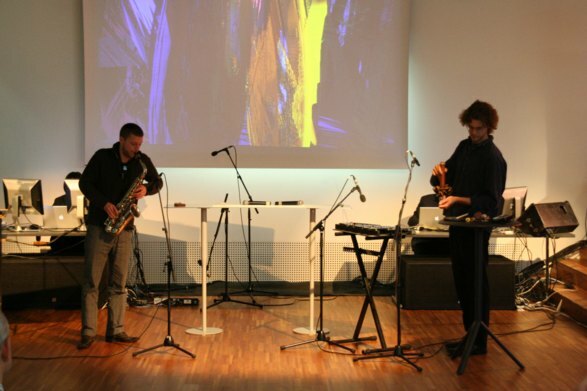 together with the experimental theatre group Projekttheater Wien, Andreas Weixler and Se-Lien are performing visual and audio sampling in a multimedia performance and improvisation. 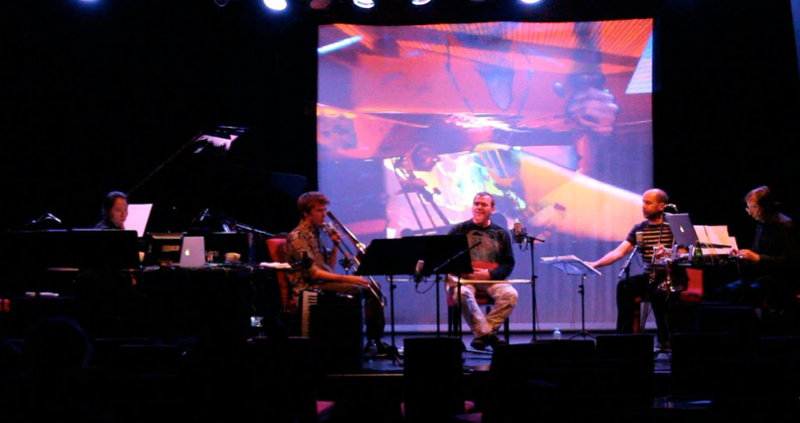 Sounds and pictures are played as instruments and reacting with the actors. 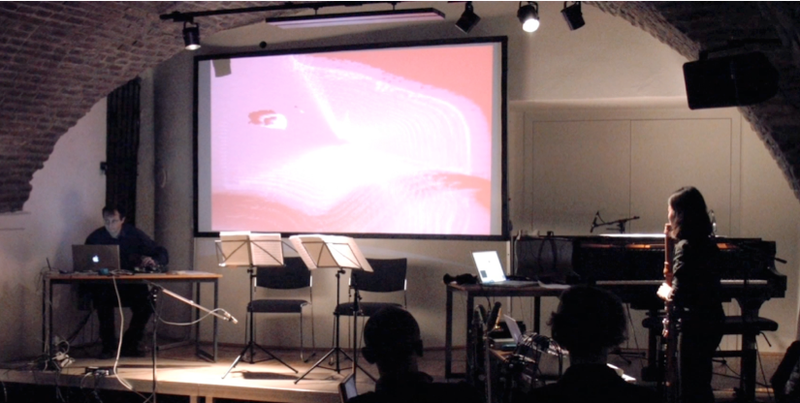 Archives: IEM, Graz, Atelier Avant, ConcertZender Amsterdam, Bild- und Tonarchiv Joanneum. 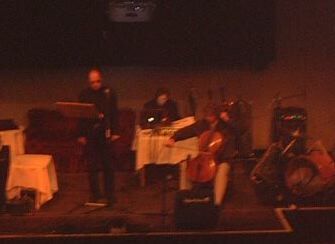 with Peter Infeld (Tenor), Karl Ratzer (Git), Luise Kloos (Reib-Glas) Andreas Weixler (audio-and visual sampler), Se-Lien Chuang (piano and Computergrafics) and the ensemble of Projekttheater Wien. 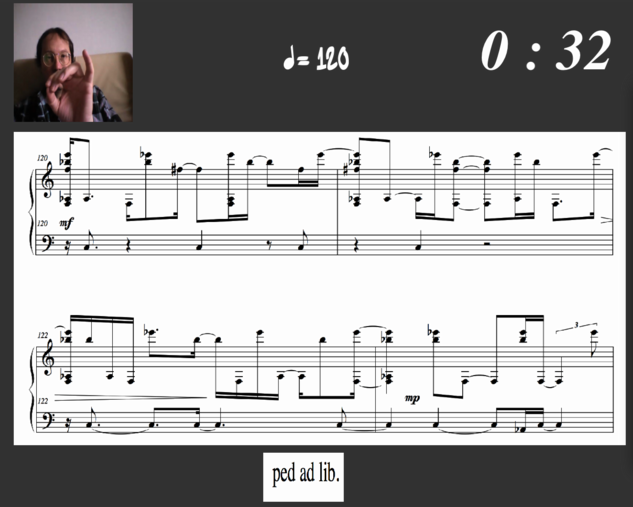 An unique experiment is combining improvisation by instructions of an interactive computersystem and realtime audio processing. 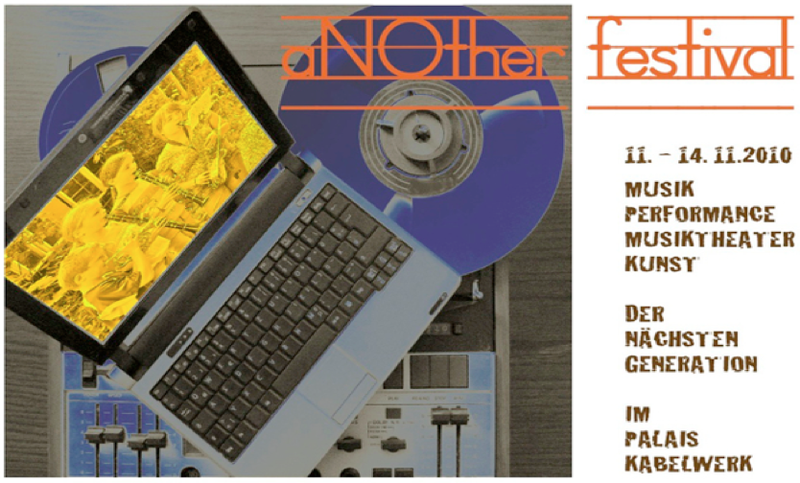 A poetical and musical interaction. The violoncello of Erich Oskar Hütter is reacting to the spoken literture of Günther Eichberger. 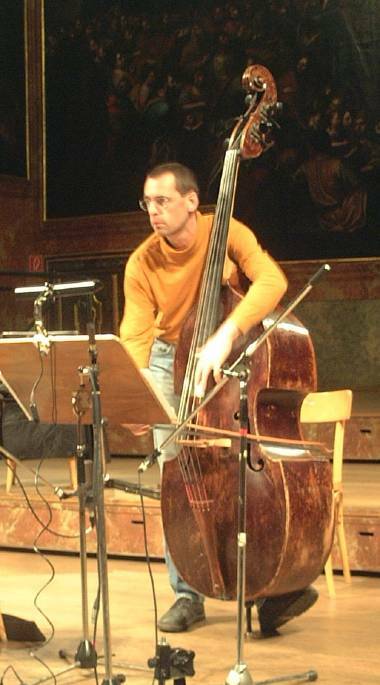 These acoustical events are processed by Andreas Weixler to an outstanding electronic sound. The word will be sound. premiere: Sa 06.04.2002 Easter festival in the Grazer Dom im Berg. 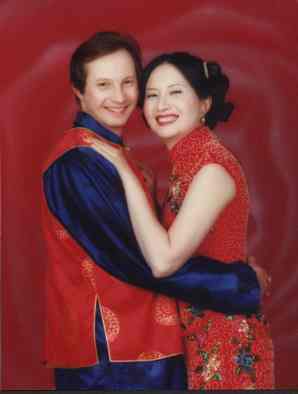 Yan-Zin is a traditional chinese instrument, in the performances played by Se-Lien Chuang. 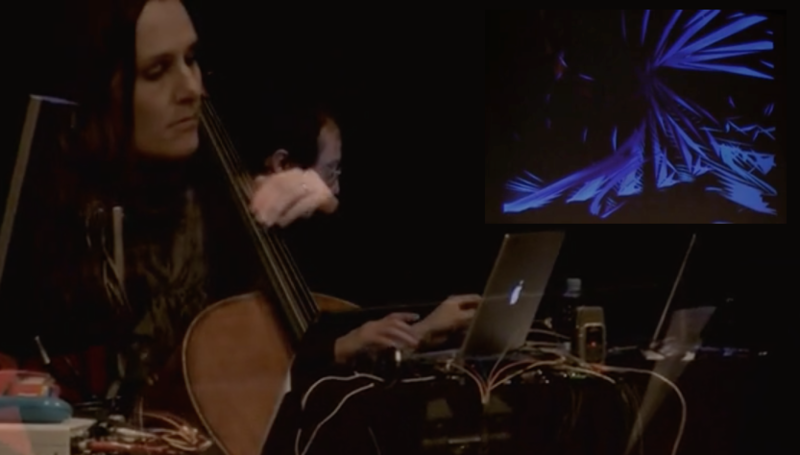 The sounds of the Yan-Zin will be digitally processed in realtime by Andreas Weixler to bring together traditional asian instrumental sound and contemporary western computer music in an improvisation of two musicians. 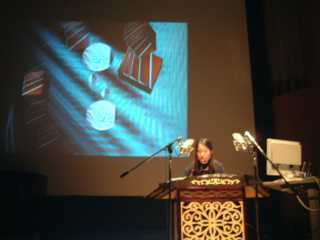 The dynamics of the piano, played by the taiwanese pianist Chuang Se-Lien, is triggering a computersystem, which then is accompanying her play with sampled and computer generated sound in a multi channel perfomance. 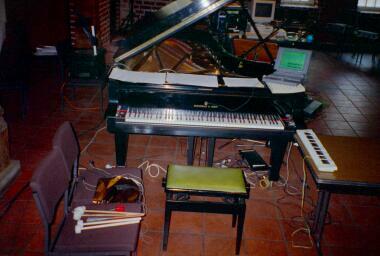 The sound contemporary playing techniques of a preperad piano is processed in realtime by the computersystem ISPW (IRCAM Sound Prcessing Wokrstation) programmed in Max on a NeXT computer. 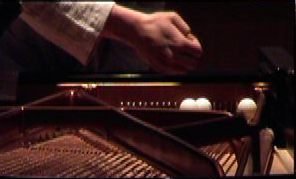 The sound will be frozen, sounding like an endless reverbration, and then is filtered, so the computer can be played as an musical instrument with the choice of pitch and color of the electronic sound generated out of the live sound of the piano. 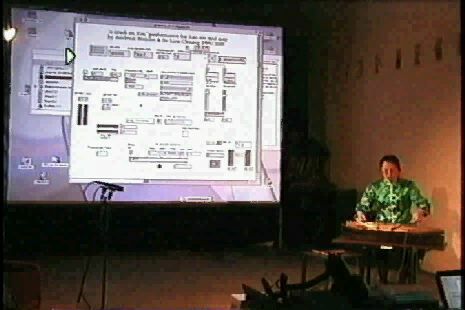 The composition is also controlled by a sequence of a Macintosh computer. 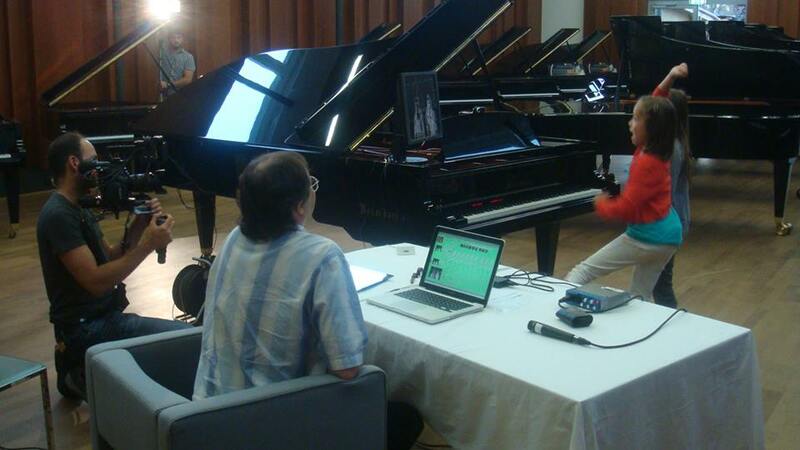 The sound contemporary playing techniques of a preperad piano is processed in realtime by the computersystem ISPW (IRCAM Sound Prcessing Wokrstation) programmed in Max. 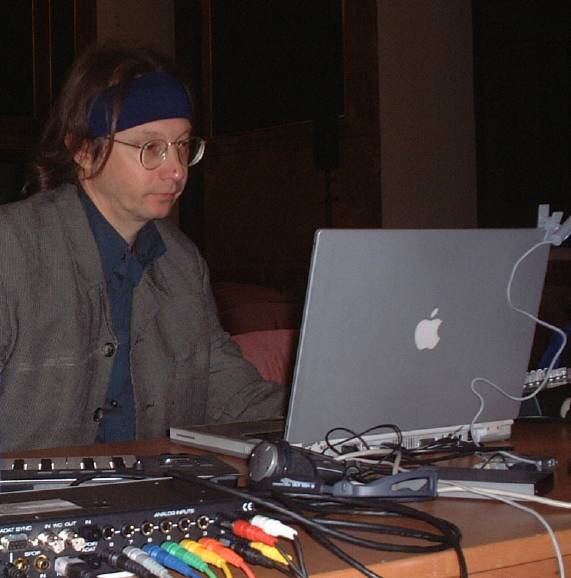 An other computers system programmed in Max for Macintosh is the hidden communication system bewteen the 2 player (Andreas Weixler, guitar, Se-Lien Chuang piano) and the controlling of the ISPW (Thomas and Wolfgang Musil). 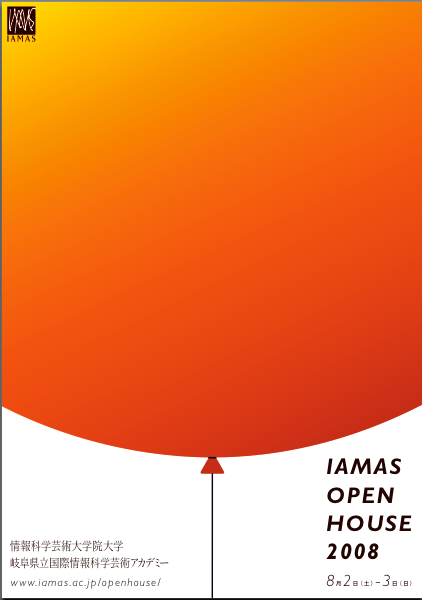 So improvisation becomes a more complex situation of improvisation. 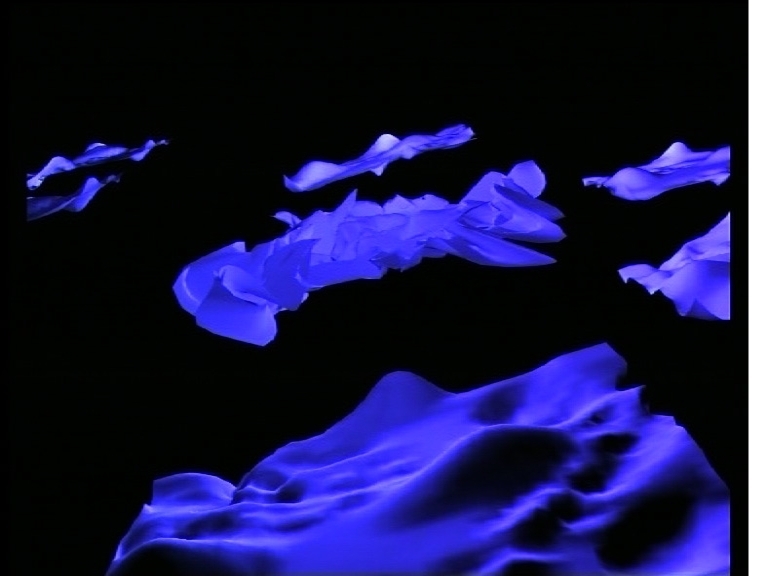 the room is breathing slowly, one breath takes 7 minutes, so it is worth to stay in the room longer to receipt the inifinite movement in this audiovisual composition. 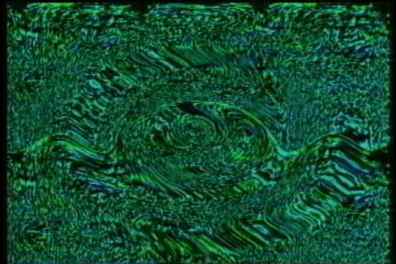 the video is created by using infinite video feedback controlled by the artist Se-lien Chuang, the music is the feedback of a short click in an infinite electroacoustic room. Galerie Werkstadt Graz, 18.02. - 12.03.2000. Images Acoustiques, DVD Präsentation des Studio SAMT in der Galerie Maerz, Linz, 28. 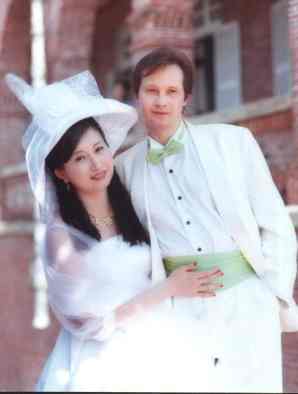 Mai 2003.